As you can see the bold text in not translated. After discussion on #ubuntu-translations it seems that the .policy files have not been exported. The image above is for the slovenian language. I just encountered this bug. Is there a work around or a fix yet? I'm attaching the exported translations from Launchpad, so that it is easier to fix this bug an make an SRU. Also note that addressing bug 663150 might save us from these situations in the future. For some reason I can not "nominate for release", launchpad OOPSes if I click on that. Accepted aptdaemon into maverick-proposed, the package will build now and be available in a few hours. Please test and give feedback here. See https://wiki.ubuntu.com/Testing/EnableProposed for documentation how to enable and use -proposed. Thank you in advance! I installed it a few minutes ago, but the string "To install or remove software, you need to authenticate." is still in English within Traditional Chinese after reboot. We have translated it on 2010-08-26. Maybe the translation has not updated. I have tested 0.31+bzr506-0ubuntu4 and the string in question is now correctly translated into Slovenian. I attach a screenshot which shows 0.31+bzr506-0ubuntu4 installed but the string is still English. The new version works for me too. > string is still English. msgid "To install or remove software, you need to authenticate." I also used msgunfmt to convert the aptdaemon.mo in /usr/share/locale-langpack/zh_TW/LC_MESSAGES to do a recheck, the string has TRANSLATED indeed while it still shows the English string. Quite odd, though. 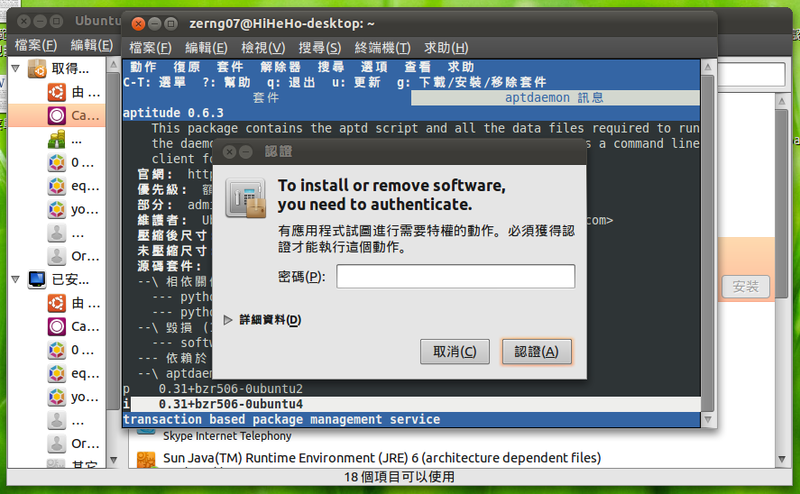 I just installed Chinese locale, and tried to install something from software-center, and I see the problem too - while it works in Hungarian! (at least the end of it) - seems that the string is translated for all three Chinese locale. > (at least the end of it) - seems that the string is translated for all three Chinese locale. Thanks Gabor and Cheng-Chia Tseng for the testing. adding a comment with a link to it, so we can follow it up? @ Gabor Kelemen: Would you kindly do me a favor to file another bug for Chinese locale? I am being busy lately (a examination hosted next week on my school), though I will file another bug some days later after that.